My winter bicycling cred is nonexistent. There are families I know who ride in snow and ice and purchase things like studded tires. I live in California for a reason—I would rather tackle the mega-hills of San Francisco than deal with being cold or hot. When I got accepted to Berkeley for my PhD I was living in Boston, and I used to read the weather reports for San Francisco every morning, longingly. I’ve never looked back. So when I learned that temperatures this week would be below freezing and that we might get snow, I was horrified. San Francisco, you hussy! But I was not completely unprepared. Last year temperatures in the city dropped below freezing as well. (Thanks a lot, anthropogenic climate change.) As an adherent of the “no bad weather, only bad gear” school when it comes to rain, I decided to try the same approach for cold. Most of the time when it’s cold the kids go into the Bullitt, because although I generally consider my children intelligent, when it comes to dressing for the weather they are complete idiots. “I don’t need my jacket! I’m too cold! Wah!” Repeat ad infinitum. The canopy on the Bullitt is advertised as a rain canopy, but it also blocks wind and warms up like a greenhouse with a kid or two inside. They wear jackets in there but only because it’s cold in the garage before they get in, and we give them a blanket, but mostly they use it to play peekaboo. Once I shoved my daughter under there in her pajamas with a blanket over her to get my son to school when Matt was away, and she slept the whole trip. I don’t think she even realized she was not in a bed (we get earthquakes here, the bouncing was a non-issue). A trailer would work the same way, of course. She’s smiling under there but who can tell? Under the blanket: Muddy Buddy and rain boots. However we do occasionally have to get the kids around in a child seat. This morning, alas, was one of those times. I took my daughter to preschool solo, and Matt had the Bullitt. What she wore: regular shirt and pants, because her preschool is well-heated. For kids’ outerwear, given that kids are not moving on the bike but have to deal with a lot of wind, I wanted both insulation and windproofing. So over that she got her Muddy Buddy, her ski jacket, her ski mittens, her rain boots, a fleece balaclava, and a stadium blanket that’s fleece on one side and waterproofed fabric on the other. Result: she said she was warm and kept asking me to take the blanket off. So when we got to preschool I took the blanket off. “I’m too cold!! !” Quelle surprise. This is an outrageously stupid look but the only thing that bothers me about it is that other parents can’t see me smiling when they pass by and I worry that I’m coming off as rude. In serious cold I would add her ski goggles over the balaclava, but that hasn’t happened yet. 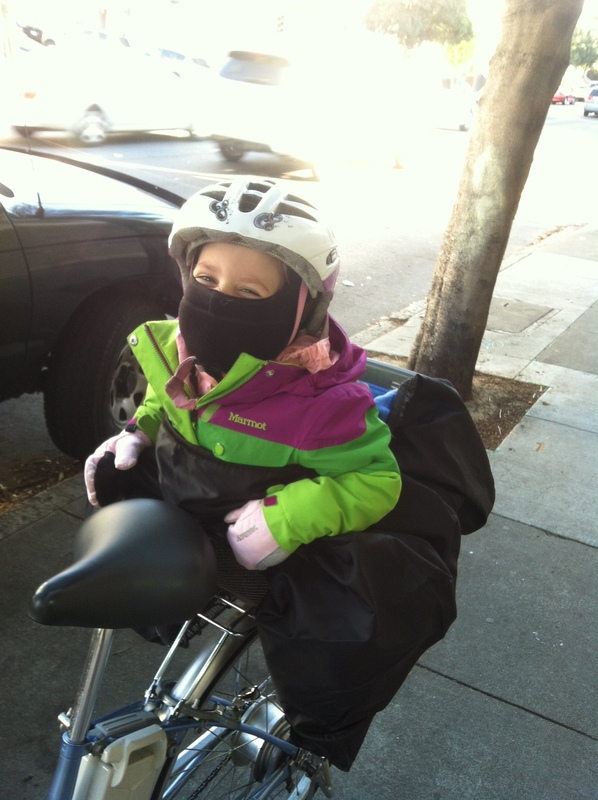 I suspect this level of gear would serve a non-San Francisco kid in much more bracing temperatures. With all the waterproofing, it would shrug off sleet as well. Not that I would feel comfortable riding a bike up and down hills on sleet-covered streets. Rain pants, rain boots. Not seen: dress pants, merino wool long underwear. And how did I dress today when it’s 30 degrees Fahrenheit (-1 Celsius, 272 Kelvin) in San Francisco? On the top: merino wool long underwear with a cashmere sweater over. On the bottom: merino wool long underwear and socks, with dress pants over them, and leather loafers. Outerwear: Long wool coat, cashmere scarf, silk balaclava, merino wool gloves, ski mittens, rain pants, and rain booties. 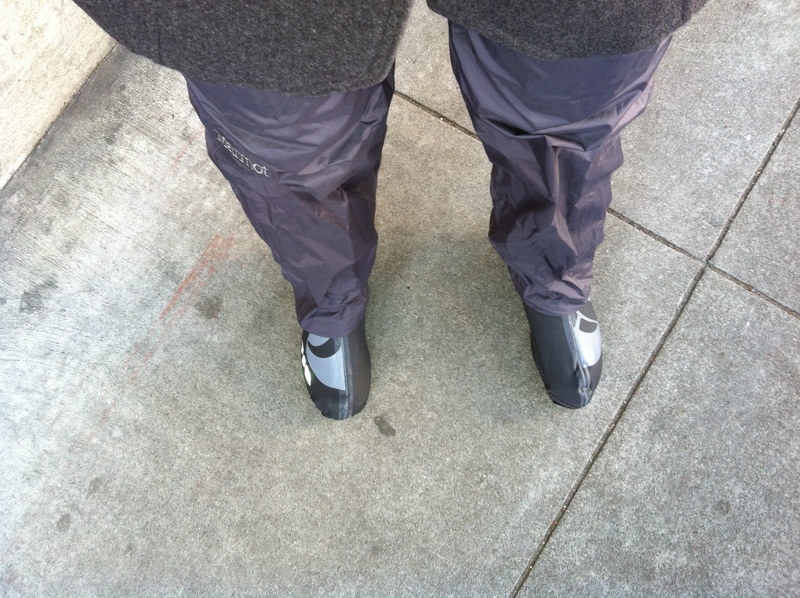 The rain pants and rain booties are waterproof, so they also block all wind (that means I didn’t really need the long underwear for my legs, but the heat in my office is unpredictable so I wore them anyway). Is this total overkill? Absolutely. The result? I got overheated. I call that an unqualified success. I am a total weather wimp, as mentioned, so I’m guessing that my ridiculous getup would keep a normal person comfortable at temperatures way below freezing. And everything that I don’t wear once I get to the office can be stuffed into my helmet when I get to work, so it’s space-efficient. The insight to ditch biking gloves and jump directly to ski mittens comes from the many fine riding parents of Rosa Parks Elementary School. Thanks, guys. I credit the family riders of Portland for the insight of wearing merino wool long underwear under everything, a tip I’ve passed on to my chronically cold mom, who is even more delighted than I am. Wearing rain gear in the cold is my personal innovation. I did it because I already had the rain gear, but as a windstopper the rain gear is unparalleled. And that’s how I ride when it gets cold(ish) in San Francisco. I may look stupid, but I’m still having fun. Looks great! I couldn’t get a comfy fit of ski goggles over bike helmet for my four-year old the other day so we’ll probably switch to using his snowboarding helmet when he wants to use the goggles. I’m sure you’ve thought about sticking a picture of a smiling mouth on the front of your balaclava? 😉 I’ve seen reflective mustache stickers, but not reflective smile stickers–could almost do the trick! A reflective smile sticker: brilliant! And all your insight, I would never have thought of it! Though it’d leave stickum if you want to wash the balaclava. Fun Reflector has iron ons, too. I cannot wait to see the followup picture! Here’s my winter cycling bonus tip for you and the kids. Have you ever been bummed to get an ice cream cone while cycling but the whole thing melts because it turns out the wind over the ice cream causes it to melt way more quickly? It turns out that ice cream cones don’t melt in sub-freezing temperatures! Although my own first reaction was to shudder, I’m sure my kids will love this insight. 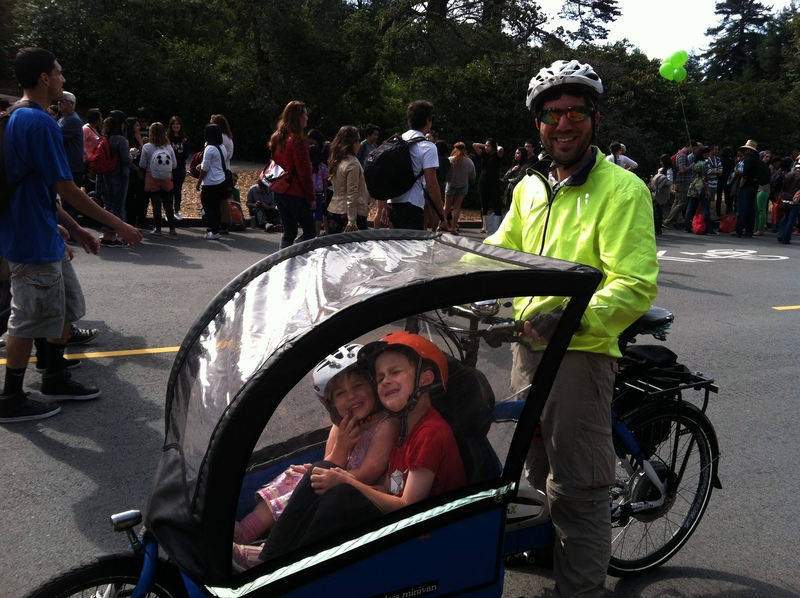 I almost bumped into you this morning – I was riding down Webster as you crossed over on Sutter and it made me chuckle since you and I and the kids were dressed pretty similarly! Rain pants in this weather work great and I invested in headband ear covers for us all but Oliver was complaining of cold cheeks so I either need to get a balaclava or go with a scarf. Love the ski mittens suggestion as I did notice that my riding gloves did not actually keep my hands that warm. I think it actually took us longer to get dressed to go out than it did for us to ride the 1 mile to school but it was worth it to stay warm! Can’t believe I missed you guys! The ski mittens have been awesome. I have been known to stick merino liners under the gloves under the mittens as well. Because I am that much of a wimp. Ha, you look like a typical Seattle cyclist in winter. I wear changeable lens “sunglasses” or eye protection all the time, so no goggles needed for cold weather. 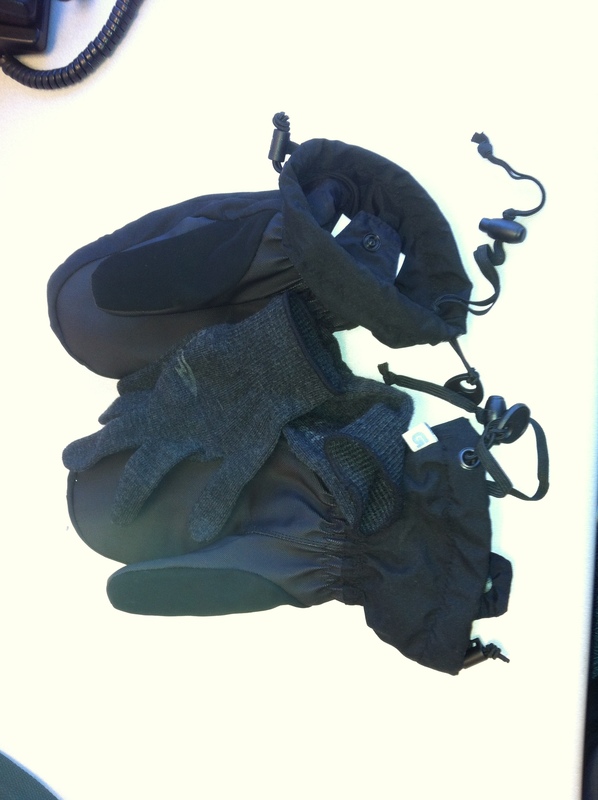 I do wear a windproof jacket, full length cycling pants, and light full finger gloves below 60 degrees. I never wear anything “waterproof” (even in the rain), as I want my clothing to be very breathable for climbing hills – otherwise I would be soaked underneath the waterproof clothing. I add a headband and insulated bicycle gloves below 50 degrees. Once down in the 30’s (like the last week here in Seattle), I go to gloves with more insulation and more layers on top. On the occasions I bike down into the 20’s, I add a windproof fleece face mask and neoprene booties to cover my shoes, because with the downhill descents, your face and feet will freeze without them. You are inspiring! Here in Boston it has been below freezing in the mornings a few weeks in a row, and I have been wimping out and taking the car after one day my child cried when we got to school on the bike and his legs were sooooo cold. I really felt bad for him that day because it was my own fault for not making him wear his snow pants! We just need to get up a little earlier to have time to dress for the weather and we will be OK on the bike. Thanks for the reminder not to be a weather wimp!! 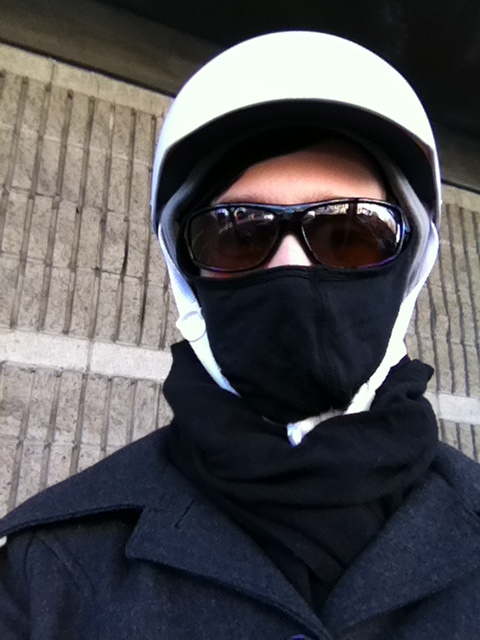 I’ve been stumped about doling out fashion advice for winter-riding. Like you, I suspect that long underwear and windproofing is key, but what do I know? I’ve been living in SF for the past 4 winters? I’m looking forward to January when it finally starts warming up. Well, we’re not the only riders who mostly have decent winter weather, and surely some of those people want to look stylish too? I’m with mom: You sold me on merino unders! I was cycling last weekend to somewhere I expected to be standing around in the wind (expectation: met) and the pair that you gave me worn under my cargo pants got the job done. I think I tend to overheat more than you, so I’m not likely to wear rain gear for cold unless it’s well below 30, but I think I need to also take a page from your book in re: mittens. My hands are always too cold.